Stopped by Rocky Mountain Chocolate Factory the other day to grab a caramel apple (Tiger Butter is the best!) and spotted these Dipped Cupcakes. 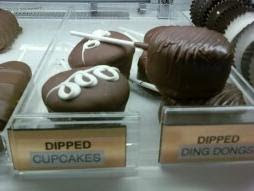 Although I think the Dipped Cupcakes look more like Ding Dongs, so I'm not sure which is which. Either way, not very appealing to me. Dipping a cupcake is like hiding the taste. Isn't that why chocolate-covered grasshoppers exist? You certainly wouldn't eat a grasshopper any other way. But I could be completely wrong. Rocky Mountain does have lots of delicious treats. Next time.